Hektar Real Estate Investment Trust (REIT), an investor in shopping malls, says it is in talks to buy new assets and plans to sell more units to fund future purchases. "We are in the midst of negotiating for new acquisitions, but cannot divulge any more details at this time," Hektar Asset Management Sdn Bhd chairman and chief executive officer Datuk Jaafar Abdul Hamid told Business Times in an interview. Most of the potential buys are located in Peninsular Malaysia, he said, adding that it was in talks with township developers and other asset managers. "The typical shopping acquisition is quite significant, starting from RM100 million and above, and will definitely require us to raise equity-financing to place that acquisition in the REIT." While there was no firm plan yet to place out additional units, Jaafar said he was pleased that the capital markets had rebounded substantially in the past few months. "Hopefully the timing would be conducive (for us to sell new units) when we close any acquisitions," he said. Units of Hektar REIT have risen 36 per cent this year to end-November, but still trails the 44 per cent gain in the benchmark FTSE Bursa Malaysia KLCI in that period. 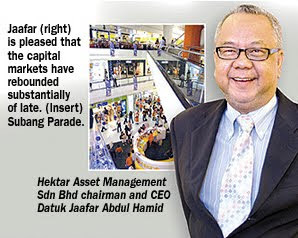 Hektar REIT owns the Subang Parade shopping centre in Subang Jaya, Selangor; Mahkota Parade in Malacca; and Wetex Parade in Muar, Johor. The fund's gearing ratio was 41 per cent as at end-June, quite close to the 50 per cent limit set by the regulator for a REIT. Although a unit placement exercise will pare down its gearing and raise more cash for potential acquisitions, Jaafar said it was careful not to dilute the dividends received by existing unitholders. "We believe it is important to deliver steady growth in the form of dividends to our unit-holders. We hope to establish a track record as an asset manager that delivers stable returns. So if we were to do a placement, it would be to acquire productive assets which would support the REIT's income and dividend growth." While rival Axis REIT has garnered more investor attention after converting into an Islamic REIT, Jaafar said that Hektar had no plans to follow in Axis' footstep. "We have studied the Islamic REIT model since before our initial public offering and will continue to monitor the feasibility of the model," he said. "(But) we realised it was not a simple proposition for retail properties because it meant that we would eventually, over time, have to eliminate various types of tenants, such as conventional banks, conventional insurance branches, health clubs, cinema, to name a few. "This is a challenge, especially for a shopping centre, to remain relevant without these amenities for consumers."